Wheat futures swung back to negative territory Tuesday as Egyptian President Hosni Mubarak's appointment of a new cabinet failed to halt demonstrations. NEW YORK (TheStreet) -- Wheat futures swung back to negative territory Tuesday as the political situation in Egypt remained unsettled. Protests calling for the ouster of Egyptian President Hosni Mubarak after 30 years in power continue in the country, which is the world's largest wheat importer. Mubarak has announced he will not seek re-election in September elections but the crowds don't appear to have been placated as yet. Similar unrest has been spreading across the Middle East and North Africa as the masses lash out amid rising food and energy costs. Tunisia's government was dissolved on Jan. 14 following a revolt. 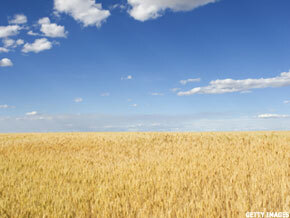 Wheat for March delivery fell 5 cents, or 0.6%, to $8.35 3/4 a bushel on Tuesday. Other grains such as soybeans and corn spiked as thousands of truck drivers and port workers went on strike in Argentina, preventing the shipment of grains from the country's main grain export center. The result was more demand for American grain exports. Corn for March delivery rose 6 ½ cents, or 1%, to $6.66 a bushel. Soybeans for March delivery rose 25 cents, or 1.8%, to $14.38 a bushel. Cotton prices also rose, reflecting concerns over supply constraints amid voracious China demand driven by a vigorous domestic retail market and major cotton exporter Egypt's inability to export the commodity at previous levels of volume and efficiency. Cotton prices for March delivery rose about 4 cents, or 2.3%, to $1.72 a pound. Food stocks ended Tuesday's trading session mixed. China Marine Food Group ( CMFO fell 2.8% to $3.84, while AgFeed Industries ( FEED rose 1.2% to $2.55. American Lorain ( ALN ended up 0.7% to $2.89. >To follow the writer on Twitter, go to Andrea Tse. Copyright 2010 TheStreet.com Inc. All rights reserved. This material may not be published, broadcast, rewritten, or redistributed. Something is amiss, as macro asset classes are pricing a slower-growth, risk-averse environment ahead.